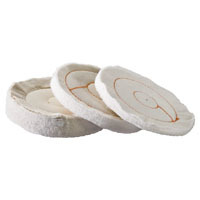 Departments - BUFFING WHEEL BP36 4"
Cushion Sewn Buffs - Used for light cutting and coloring. A superior grade of fine cotton sheeting held together with two or four circles of lockstitch sewing. Gives a resilient, cushioned effect when in use. Blistered and boxed buffs have a 1" hole size packaged with DICO toothed flanges for 1/2" spindle. With bulk orders please specify required arbor hole size.